©Neil Turner, November 2014. 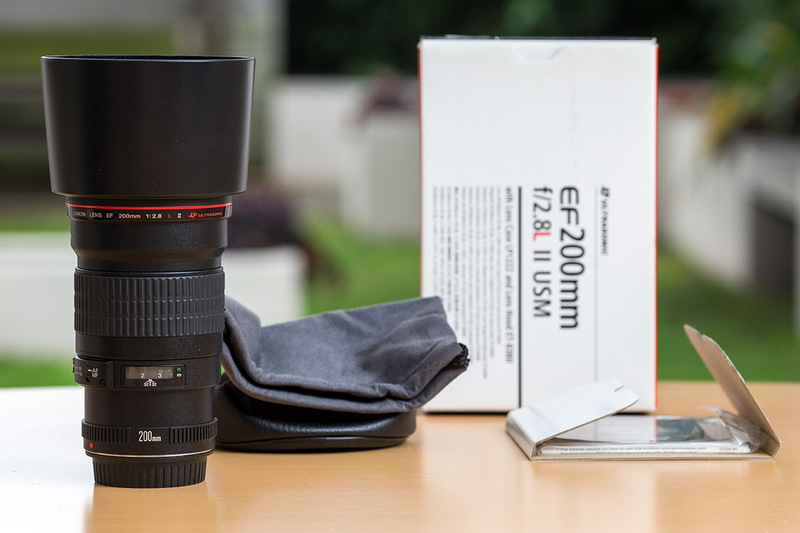 Canon EF 200mm f2.8L II USM lens. There are lots of things about the world that I don’t understand. Some of them I ignore, some I oppose and there are others that I just go along with. One of those that sits squarely in the latter category is the obsession with keeping the boxes for items of photographic and computer equipment that you are intending to use. I go along with it because people are actually prepared to pay more for a used item if you have the original packaging. Basically, it appears, you are prepared to pay me a premium for a secondhand piece of kit if I keep cardboard, plastic and polystyrene in my loft so that you can do the same during your ownership of that item. It makes sense for collectables where the market loves “mint in box”. We have a few Star Wars items safely tucked away still sealed in their original packaging and I have a couple of Corgi model cars in their boxes too (the box for one on my desk is actually more attractive than the die cast metal contents anyway). But the logic of hoarding packaging for something that is in use is beyond me. Again, I get the concept of saving the instructions and any accessories (I have a massive box full of both of those) but not the packaging. It’s no big deal which is why I am now going with option 3 and just accepting that it is just the way it is. No sense fighting against it and ignoring it isn’t much of a principled stand! I wasn’t always of that opinion. Somewhere there’s probably a whole load of boxes being safely squirrelled away that look exactly like the original boxes for the items they were bought with but they are just substitutes. When I bought my first two Canon EOS5D MkII bodies a dealer bought the boxes and instructions from me. I thought it a bit weird at the time but £20.00 is £20.00 and I sold them. He presumably “re-united” those boxes with cameras that were missing theirs and sold them on to some unsuspecting soul who thought they were getting the original packaging. I’m not even sure why this is taking up an hour of my time thinking about why I find it so absurd – other than the fact that I am getting rid of some superfluous gear and one of the lenses really is “mint in box”. “What gear is that?” I hear you ask – it is a Canon EF200mm f2.8L II USM prime lens that I bought a few months ago when I was going through a phase of using prime lenses for as much as I could while my 70-200 f2.8L IS (ditched the box for that one in 2003) was away having major surgery. The repairs cost less than I had expected and in the end I only used the 200mm lens twice – both times indoors for large groups of head shots. I had bought the lens as secondhand myself although Castle Cameras did (which I trust) say that it had barely been used and had been originally purchased through them a few months before that. So here we have it; a fabulously sharp current model lens with all of the correct bits and pieces – including cardboard, plastic and polystyrene – which retails for £569.00 new going for the bargain sum of £449.00 + delivery. I am loath to stick it on eBay given the massive commissions that they now charge but the average selling price for one of these (and it would be impossible to be in better condition) is £473.91 on the auction site. The lens is registered with Lenstag and so I would obviously transfer that over. By clicking on the link you can check that it is verified – such a good system! I will be clearing some more gear out soon. None of it will be ‘mint in box’ because 99% of my equipment gets used for many years before I sell it on but it will be well looked after, properly serviced and verified by Lenstag. I think the reason for keeping the boxes is the belief that buyers believe that sellers who keep boxes are more obsessive and therefore more likely to look after their equipment. I’d like to ‘fess up. I have a lovely collection of empty boxes in the attic… My excuse is that they may come in useful one day when I need to send something off for service or repair. In fact I will be using a couple of boxes for that very reason soon – and I have done in the past. We can’t all nip down to FIxation, Nikon or Canon and personally deliver the stuff! My theory is that its the perfect protection for delivery. Nobody can say your lens was ‘inadequately wrapped’ if damaged by the courier. One by one you guys are dismantling my argument. Do you know how much I hate being proved wrong!! !